‘Back’ is a big word to describe going from ‘playing occasionally’ to ‘playing more regularly and updating my game again’. But I am back, in the sense that I am re-opening the blog about playing. I have been keeping a Guild Wars 2 blog for the past few months, but since we either burned out or just haven’t found the time to play it regularly, I don’t have a lot of new stuff to put there. And I do like to write about the games I play. Especially one that can give me fun images to share. So what have I done so far? I updated the game, disabled Twallan’s/Nraas’s mods for the time being, and waited to install the next stuff pack and expansion. Even with an updated game, I miss the mods. I will re-install them after installing the new packs. 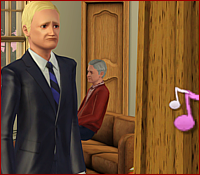 I have also downloaded some stuff to play around with from The Sims Resource. I am still not a big fan of the hair and clothes they offer, but some of the free objects are really awesome. I can now move away from the more American themed houses and built houses with interiors that look more like my own house. And I have built a little. I look forward to uploading a few homes to my sims page again. Right now, I am populating a neighbourhood with sims based on comedyshow characters. It’s just a shame that without Twallan’s mods, the neighbourhood is as dead as I remember it being. It doesn’t bode well, that this issue hasn’t been solved.